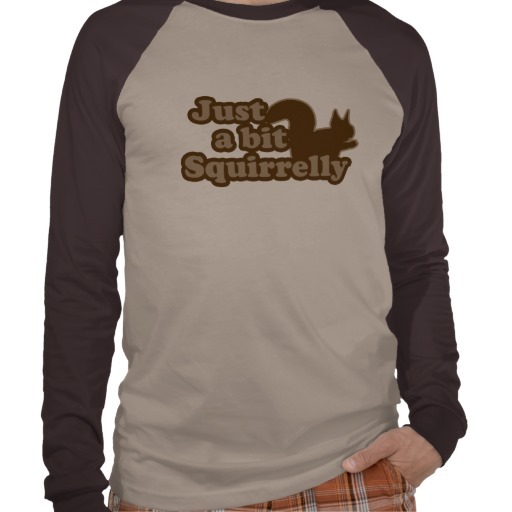 "Just a bit Squirrelly" Funny Squirrel Shirt for Men, Women, and Kids. The designer of this shirt made a good move by matching the color of the design to a particular shirt's color scheme. You can buy it, though, on a variety of other colors: it still looks good on many other muted background colors. Vector art of a tufted-ear squirrel perching on the text of this funny tee shirt adds a nice visual touch to what would otherwise be a text-heavy design. The contrasting text fill and text outline and the inverse squirrel fill and squirrel outline give the image some variation and help the text pop on a variety of backgrounds. You can support the designer and buy this squirrel shirt by following the link above.